Weekly Fantasy Football player projections; rankings that evolve with the NFL season. 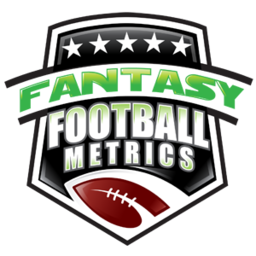 Our Weekly Projections are part of our Premium Fantasy Football Metrics Content package. We use statistical tools to project performance and locate value, and occasionally that data leads us in a direction that doesn't pan out or a player gets injured, etc. We want to be like a casino of sorts, sometimes an individual event goes against you...but, ultimately "the House" wins. The more we move the needle in our favor the better it improves our own Fantasy Football Team's chances of success, and hopefully that data will assist you as well. No crazy claims here of "everyone will win every league following our website". Heck, in 2009 I lost in the first round of the playoffs in a 4-team league with my wife and 2 teenage boys; all 3 of which don't even follow football (I was the #1 seed going into the family playoff if that spares some embarrassment!). I do very well in leagues that just count point totals (no wins and losses, just point accumulation). I count my success in head-to-head leagues as just getting into the playoffs, once in the playoffs for a 4 or 6 team tourney the last few weeks, anything can happen in crazy NFL Weeks 15-16-17. We try to bring you data that will make people re-think traditional thoughts, find hidden value ahead of the competition, get us into the playoffs as a top seed, and then we try to out-maneuver the field for the title. This is not a sprint, nor is it a marathon; time is of the essence. Everyone likes a fast start, but some of us are going to start out 0 and 1. The season is not over after one loss (maybe after 0-2 it's over, but not 0-1..kidding, kinda). In-season adjustments are as, or more, important than the Fantasy Drafts. The management and homework never ends, we want to assist with that homework.